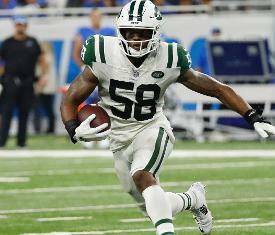 Predictability killed the cat in Detroit on Monday night, according to New York Jets linebacker Darron Lee. Lee, who intercepted a Matt Stafford pass and returned the pick for a touchdown as part of the 48-17 shellacking of the Lions on "Monday Night Football," said the Jets were able to identify "everything" Detroit's offense attempted to throw at them in the season opener. "We were calling out their plays as he was getting up to the line," Lee said Monday night. "We knew his signals. We knew everything. That's just preparation as a defense. ... It just seemed like we were in his head as a defense." The Jets intercepted Stafford four times and intercepted backup Matt Cassel once, overcoming a pick-six by rookie quarterback Sam Darnold on his first NFL pass. "We was able to just take advantage of plays and stuff that we knew that they run a lot of," Jets cornerback Morris Claiborne said. "Our film study this week was great. It was probably one of the best I've been around as far as preparing for the game. And one of the big things, us as a defense, we want to talk, and we was out on the field, certain guys were seeing certain things that showed up in reports and they're calling it out and get everybody on the same page, so at least we have an idea of what's about to happen or where they're trying to beat us or how they're trying to hurt us." Detroit's offense is still run by Jim Bob Cooter despite a change at head coach from Jim Caldwell to Matt Patricia. The offensive tendencies and literal signals picked up by the Jets in preparation for the opener were all in play Monday night at Ford Field. "Not going to walk through all of the (interceptions)," Stafford said Monday. "The story of the game is turnovers. We had too many of them, I had too many of them. Can't do that to our team."